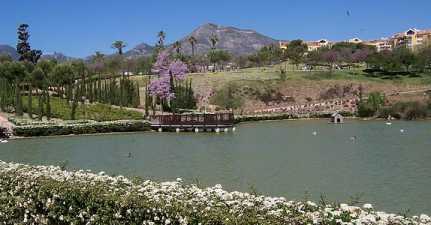 Benalmadena Costa is a beautiful Andalusian coastal town situated 10 miles west of Malaga airport. 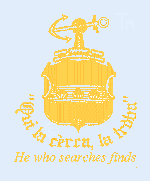 It has an excellent climate with over 300 days of sunshine per year; constantly mild temperatures, which average well into the sixties even during the winter months. 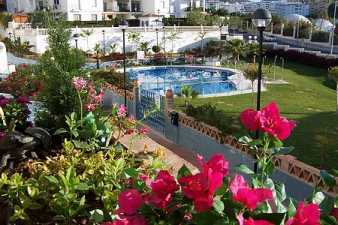 This apartment is available to rent: - 2019: availability please enquire If your dates don't match, please scroll down to the links for other Costa del sol apartments / villas. 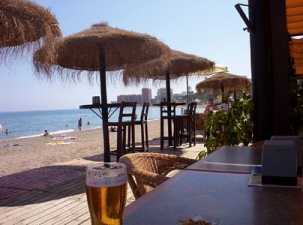 Benalmadena has many amenities to make a holiday enjoyable for all tastes... hands of that ice cold beer! It has over 5 miles of sandy beaches and bays, with many sporting facilities available for hire and boasts one of the largest and busiest marinas in Spain, which provides the visitor with the opportunities to participate in fishing trips, sight-seeing trips, shopping in the many elegant shops or to just relax in one of the many restaurants and bars. The famous Tivoli World theme park can be found at Arroyo, which is inland from the Costa, and only 10 minutes stroll from the apartment. A cable car is available from Arroyo to take you to the top of the local mountains and provides fantastic views of the countryside, towns and coastline. Paloma Park with its lake and animal centre is home to many different water fowl and turtles. 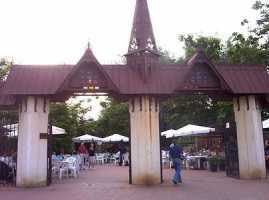 There are two Spanish bars within the grounds together with an icecream and refreshment bar. Rabbits, chickens, peacocks, etc., freely roam the Park and there are lovely walks through and around penned animals and streams. The Park is also home to the Selwo Dolphin and Sea Lion attraction, which includes Parrots and Penguins shows. Benalmadena Costa enjoys a 9 kilometer stretch of attractive beaches and all the sporting and leisure possibilities of a busy resort town. You can stroll down one of the most attractive promenades in Europe and enjoy the relaxing blend of sea and sand as you're drawn in to seafront restaurants and shops. 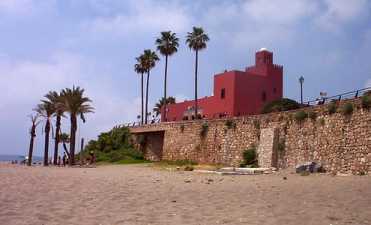 Directly down from the apartment on the promenade, which is a five minute walk away, this attractive building gives the flavour of the Moorish ancestry that dominates Andalusia. It's interior is cool and refreshing, even in mid Summer, and local artists display their original art for sale in this unique 'gallery'. The rental apartment is situated in a quiet location adjacent to Paloma Park, within 5 minutes stroll of the beach, restaurants, bars and shops. Accommodation consists of a lounge / diner with a double sofa-bed, 2 twin rooms, ensuite bathroom and a further shower room, plus a large fully fitted kitchen. The apartment has a private terrace with views (see photos below) that overlook the landscaped gardens and community pool. The apartments are enclosed within a secure environment, which can only be accessed by residents using keys or the intercom system. Prices are from £200 to £450 (GBP) per week depending on the Season. Long-term rentals at negotiable monthly rates are available during the Low Season. The prices shown include cleaning expenses. 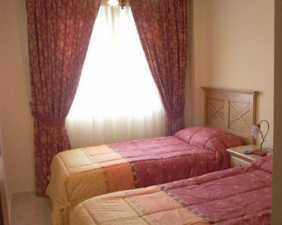 The apartment is cleaned each weekend for those staying for more than 1 week on short-term rentals. 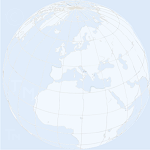 A holding deposit of 50% of the rental fee is required to confirm a booking, and the outstanding balance is due 6 weeks prior to departure. A deposit of £200 is required, which will be refunded on the return of the apartment keys and subject to the apartment being left in a suitable state. Minor breakages are accepted.